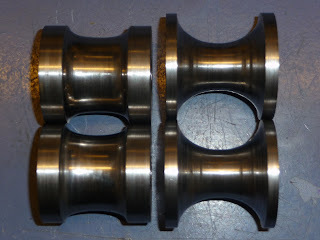 I need to make some more elliptical tubing. 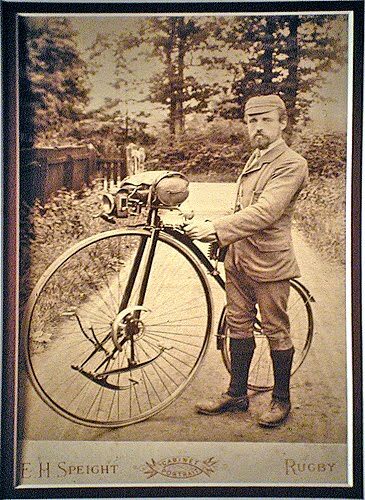 You may recall my initial success with the front fork legs some months ago. I've now started thinking about how I'm going to make the backbone and rear forks, both of which are elliptical. However, the backbone and the rear forks are bent elliptical tubing which adds a new dimension to the problem. 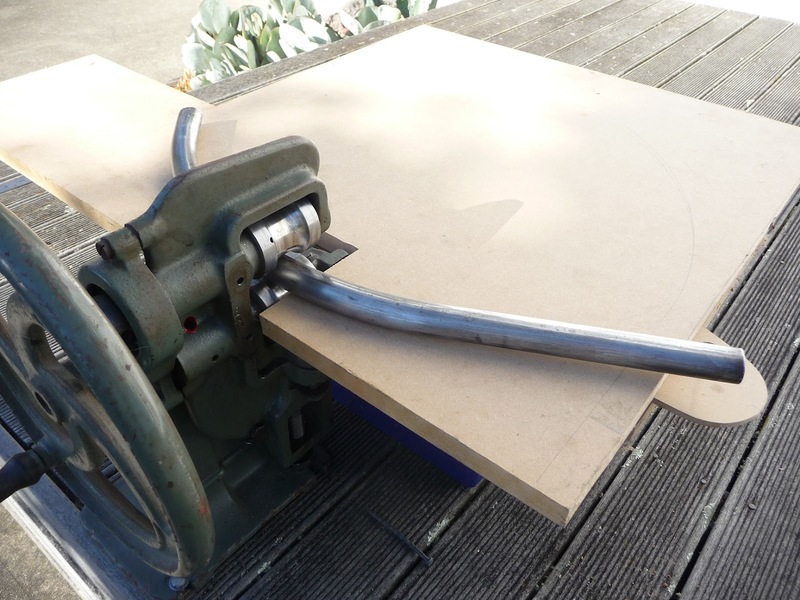 Do I roll the round tubing into it's final elliptical shape and then attempt to bend it or do I do it the other way around and bend the round tubing and then roll it into an ellipse. Well, the answer is obvious when you consider why the tubing is elliptical in the first place, to increase the resistance to bending in the plane of the major axis. So I need to bend the tubing and then roll it to profile. This sounds simple but consider what will happen to the radius of the bend when it is slightly flattened, it will tend to straighten out, but how much? I've developed a simple mathematical model to predict how the radius will change with increasing eccentricity from round to squashed flat. I'm pretty confident that it will be reasonably accurate for relatively low eccentricity and then become less accurate as more metal distortion takes place at high eccentricity. Theory is all well and good but I also want to test it with a real world example. I want to see if it possible to roll a bent tube without it bending in another plane for example. I'm going to coin a new word at this point. The word is 'Shedweek'. A shedweek is the amount of time a person can spend happily occupied in a shed during the course of a week before other family members begin to pass unkind comments. Shedweeks are clearly variable in nature. I would strongly suggest experimenting in the lower range before venturing into the more advanced upper reaches. I've spent my shedweek making some new rollers for my rolling mill, I have one pair for the backbone that roll from 1 3/8" tubing and another pair for the rear forks that roll from 7/8" tubing. 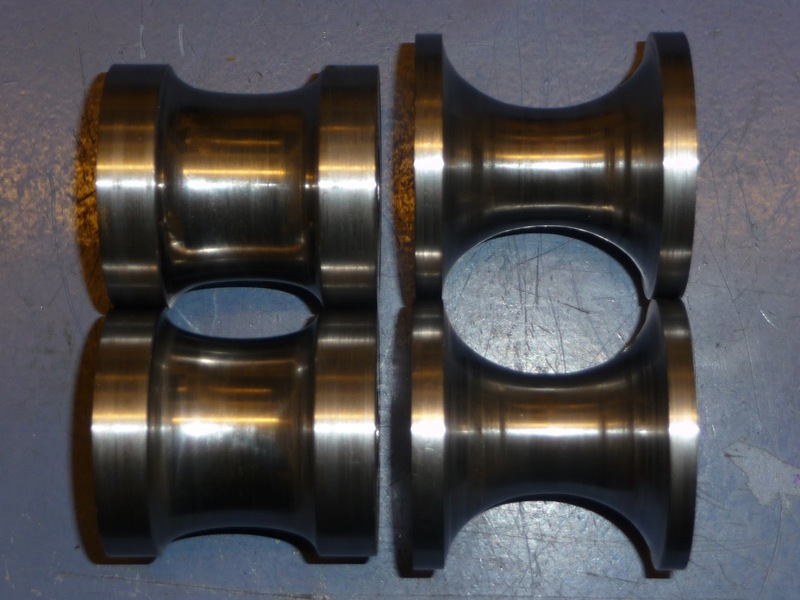 Rear fork blade rollers on the left and backbone rollers on the right. 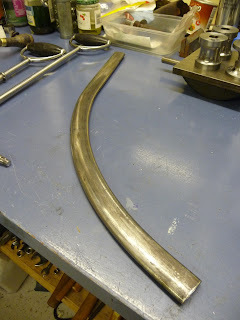 Start with a bent length of 7/8" bicycle frame, in this case the "loop" from an old ladies loop frame. 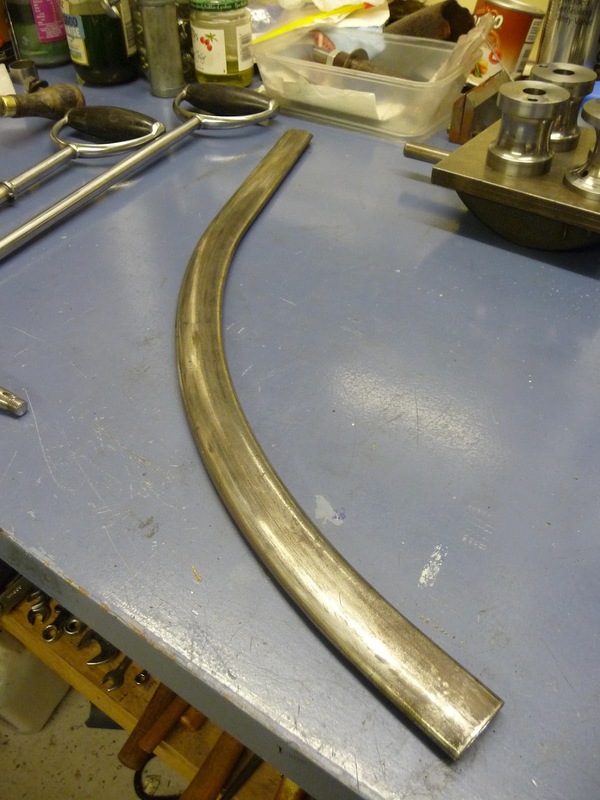 The frame had no merit other than as a donor for some suitable bent tubing. 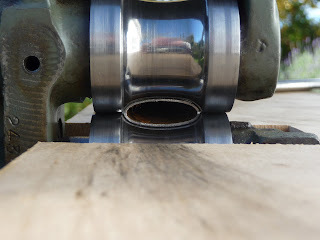 the bend in the tube just followed the rollers beautifully, it wasn't an issue at all. Frequently remove the tube, measure the major axis and draw along the radius to measure later. This will enable me to see how well my mathematical model behaves at different values of squishedness. The final shape is a nice even, flat ellipse. There is a very slight twist, as before, in the straight section, but I'm not worried about that. As it turns out my model was accurate to 98% for the eccentricity I require in the backbone. 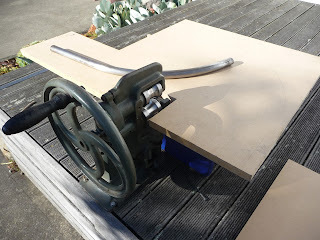 This means I can calculate the initial bend I need, which works out to an inner radius of 18.7" (475mm). 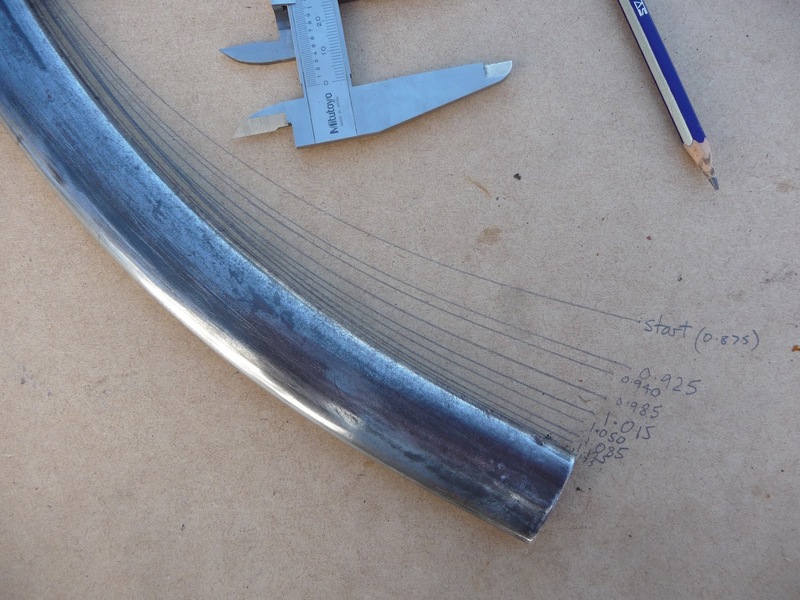 Then when I roll the backbone elliptical, it should straighten out to a final radius of 20.75" (527mm). I'll cut some of my remaining tubing, after Mr. Middleton helped himself, and take it to a company that specialises in rolling large tubes next week. The rear forks are mostly straight with a sharp bend at the very end, I have a simple tube bender that can cope with this size so I may do this bend myself. 4130 is so tough though that I may reconsider. In other news, last Sunday was Mothers day here in NZ. This had a seriously negative effect on my shedweek but I'm not about to complain. The children had made various shoddy cards and paintings of the sort that make mothers all misty eyed and emotional, but no presents. We have a rule in our house regarding presents to each other. As a normal man, I don't really do hints or observe subtle suggestions. Instead I ask for a clear, concise, written list of possible presents stuck prominently on the fridge door well in advance. I know that this may possibly remove a certain amount of surprise and romance from these occasions but it also dramatically reduces errors and improves efficiency. So I took the list and the kids shopping late on Saturday afternoon because I'd forgotten all about it until then. We managed to get all the items including the lingerie which I'm also not going to complain about. These lists always feature marzipan. I should know this by now, but marzipan, real marzipan is hard to get in NZ. It is sometimes available in some supermarkets and I generally stock up when I see it for future list fulfilment purposes. Sadly, this time, my magic cupboard could not help and we had to run around like idiots to find some. In more other news, I failed to complete a bike ride for the first time in years this week. I was riding home from work and had got to the road works where the new development is being built to the west of Kaiapoi, the one near the cemetery (the dead centre of town). The excellent road workers had left an unmarked, unlit trench across the shoulder. The night was dark and wet with thunder and lightning (very, very frightening) in the distance and I only saw it at the last second. 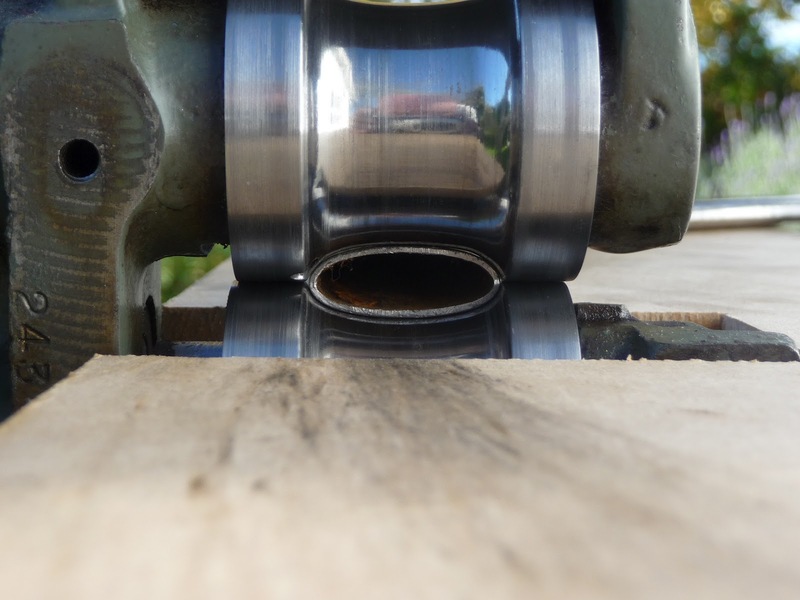 I got the front wheel over it but the back wheel slammed into the far edge and popped the tube and dented the rim. Of course at this point the heavens opened and my wimp glands came up again. My lovely wife came and picked me up after I'd telephoned her on one of these new electric "mobile phone" things. They may catch on you know.